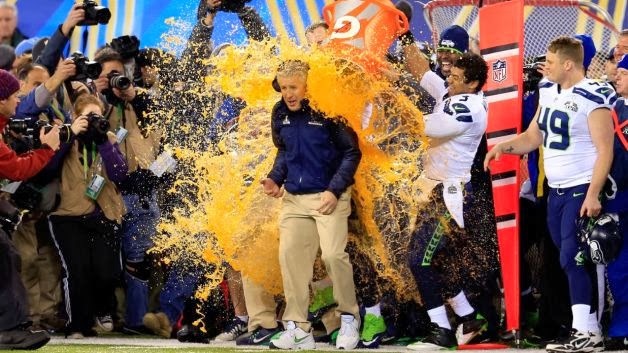 If you bet on the color of the Gatorade dump and chose orange thinking the Broncos would win... Well, you were sorta right. During football season, editors Jeremy Conlin and Joe Parello bring you the good, bad, and ugly from the football weekend that was. Here is your Super Bowl Sunday roundup. While there is plenty of credit to go around for Seattle's historic defensive effort Sunday night, I wanted to give a fellow Purdue alum a shout out. Avril has been underrated since his college days, and is usually an afterthought, even when Purdue folks talk about their supposed "Den of Defensive Ends," taking a back seat to guys like Rosie Colvin, Anthony Spencer, Rob Ninkovich, Ryan Kerrigan and a guy he beat Sunday, Shaun Phillips. All that being said, Avril was just what the Seahawks needed when they signed him this past offseason, and his work as a situational pass rusher was instrumental in Seattle dominating opposing passing games. In this game in particular, Avril lived in Peyton Manning's lap, and his pressure at Manning's legs led to an interception by Kam Chancellor early. But, in the game's biggest play (Hard to say in a blow out, but it would, ultimately, determine the MVP), Avril hit Manning's arm as he was leaning into a throw, causing the ball to flutter straight up and eventually into the hands of game MVP Malcolm Smith, who ran it back 69 yards for a score. Again, the entire defense was dominant, but Avril's rush was a huge part of Seattle's success, and I haven't heard any national pundits cite his constant pressure as a reason why Seattle's defense was special. Give a Boiler some love! Malcolm Smith took home the Super Bowl MVP trophy, but it should have gone to Chancellor, who was the best player on the field Sunday night. Many people, including yours truly, and apparently, the Denver coaching staff, expected Seattle to sit in their base Cover 3 defense, which usually leaves big gaps of space in the middle of the field, especially on first down (and often in second- and third-and-short situations as well). Denver was expecting it, and came in with a gameplan that featured a lot of short crossing routes, slants, and pick plays towards the middle of the field, to take advantage of the holes in the zone they expected to be present. Seattle's defense resembled more of a Cover 1 Robber, with Chancellor patrolling the middle of the field and driving hard on all of the underneath routes, completely negating the advantage Denver anticipated on first down. He finished with 10 tackles, six of them on passes in the middle of the field within 10 yards of the line of scrimmage. He added two pass break-ups and another interception on top of that. There are only a handful of safeties in the league that could have duplicated the game Chancellor had, and none that could have exceeded it. Chancellor always seems to be the forgotten member of the Seattle secondary, with Richard Sherman, Earl Thomas, and Brandon Browner stealing most of the headlines for various reasons, but it was Chancellor that had the biggest impact on the biggest game of the season for Seattle. So, this is what they paid this dude for. After trading away a 1st and 7th round pick in the 2013 draft, plus a 3rd rounder this year for the former Florida Gator star, Seattle only got a combined 39 snaps in two games out of Harvin. That certainly wasn't what they were looking for, as hip surgery kept him out for most of the regular season, and a concussion suffered in the Divisional Round kept him out the NFC Championship Game. Well, Sunday we saw the potential they felt validated all those picks, not to mention the $14 million in guaranteed money they paid him this year, off a 6-year, $64 million+ deal. Harvin looked every bit the electric play maker Seattle expected, turning a pair of reverses into 45 yards (surprisingly leading Seattle in rushing on only two carries) and closing the door on any hopes of a Denver comeback with a beautiful kick return. After a seemingly three-hour halftime featuring Ricky Ricard… err, Bruno Mars (who was awesome, by the way), you thought that maybe Peyton Manning would turn it around. I mean, he was only down 22-0, and he is one of the gre… Oh crap, Percy just took the kickoff back 87 yards to make it 29-0. Ok, time to go home. Hard to say that three plays justify three draft picks and $14 million, but at least he reminded us why so many teams wanted him. When he's on the field, he's a unique weapon that can help you win a title. This has been beaten to death, but Peyton Manning really had no chance. His receivers couldn't create any separation underneath or over the top, and the offensive line couldn't protect him or create any movement in the running game. The Broncos came in averaging over 4.1 yards per carry, but were held under two yards a pop, and even those two yards didn't come easily. Well, what about their great screen game, usually used as an extension of the running game? Seattle's defenders, who didn't know the play call, (though Richard Sherman now claims the Seahawks figured out Manning's hand signals) were beating Denver's offensive linemen to the perimeter, stuffing slip and receiver screens before anything could develop. Then there's the quick snap that led to a safety from center Manny Ramirez (Manny being Manny) and Orlando Franklin just being schooled by Avril on the right side. It was a sad effort all around, especially after the great season these guys had, rallying after All Pro left tackle Ryan Clady went down in week two. Yes, Peyton Manning had a bad game. Yes, the highest-scoring offense in NFL history was held to just eight points. No, it was not Peyton Manning's fault. All of the people ripping on Peyton Manning's poor performance are ignoring the simple reality that while Manning didn't play nearly well enough for Denver to win the game, there isn't a single active quarterback, and possibly no quarterback in the history of football, who would have been able to. Manning simply never had time to throw the ball, and when he did have the time, the windows to which he would be throwing into closed promptly. A more mobile quarterback (like Cam Newton or Colin Kaepernick) aren't accurate enough to evade the pressure outside the pocket and deliver a throw into a tight window. Even a mobile, accurate quarterback, like Aaron Rodgers, wouldn't have been able to do much. Instead of managing a meager eight points, he might have led Denver to 17 or 20. Better, but not nearly enough to match the 36 Seattle put up without including the pick-six from Malcolm Thomas. How did this game affect Manning's legacy? In theory, not much. His offensive line was severely out-played and the gameplan they had coming in was rendered useless by halfway through the second quarter. Yes, his two interceptions were poor throws and poor decisions, but those are the poor throws and poor decisions that Seattle's defense has been baiting out of opposing quarterbacks all season. Poor performances like this are rushed off for reactions before the proper context can be considered. The Seahawks, objectively speaking, had one of the most dominant pass defenses in the history of football. 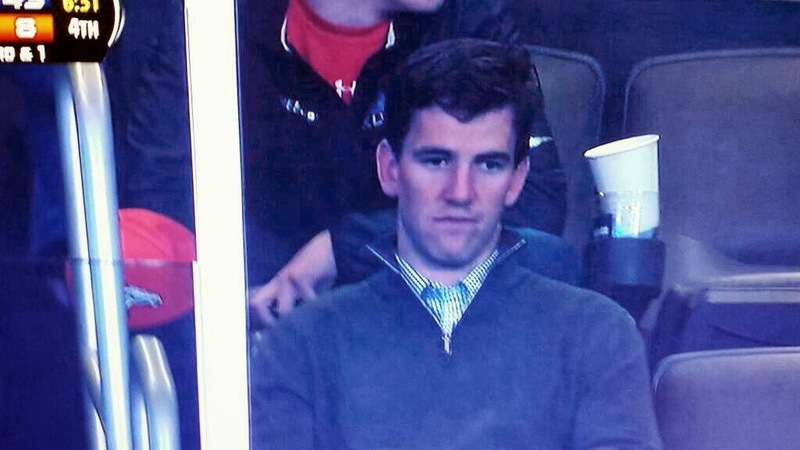 It shouldn't be a surprise that they forced Manning into a sub-par game. There was just so. Much. 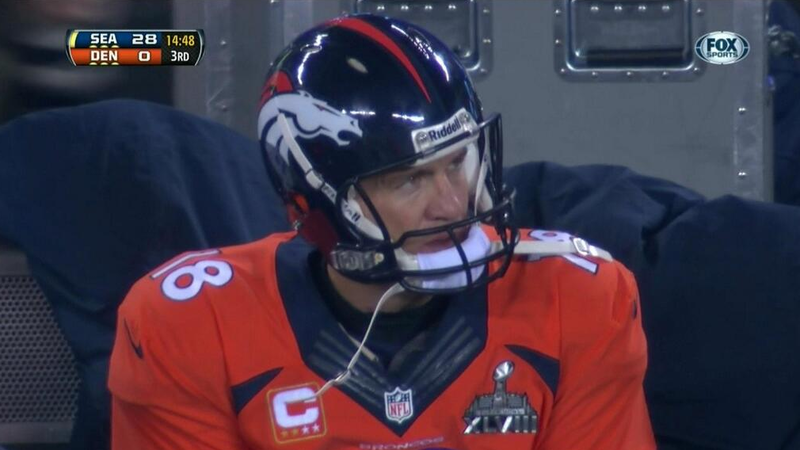 #ManningFace.